Another tragedy along beautiful Sunset Cliffs. 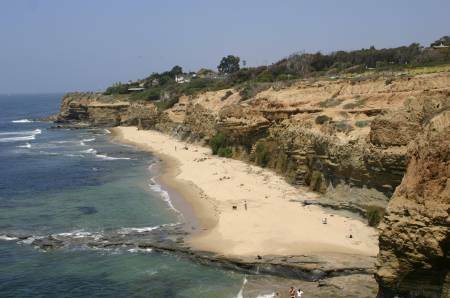 Early Tuesday morning, July 15th, a man fell to his death from falling at Sunset Cliffs. He is as yet not been identified. CNS and SanDiego6 reported that just around 4 a.m. a friend of the victim called 911 to report the fall. Reportedly, the victim feel nearly 50 to 100 feet near the end of Ladera Street. San Diego Fire-Rescue Department and San Diego police responded to the scene. But he died there at the cliffs. The U-T reports that the victim is a 27 year old OBcean, who was with a woman friend and another couple at Ladera Park. Apparently, something startled him and he lost his footing and fell. First responders reached him on the beach and gave him CPR. They were unable to revive him, police said. Let me be the first reader to acknowledge this passing and say Rest In Peace to the victim, my condolences to your friends and family.